China and Kyrgyzstan should upgrade security cooperation and jointly fight the "three evil forces" and cross-border organized crimes, President Xi Jinping said on Wednesday. Xi made the remark in a meeting with his Kyrgyz counterpart Sooronbay Jeenbekov at the Great Hall of the People in Beijing. The "three evil forces" refers to terrorism, extremism and separatism. 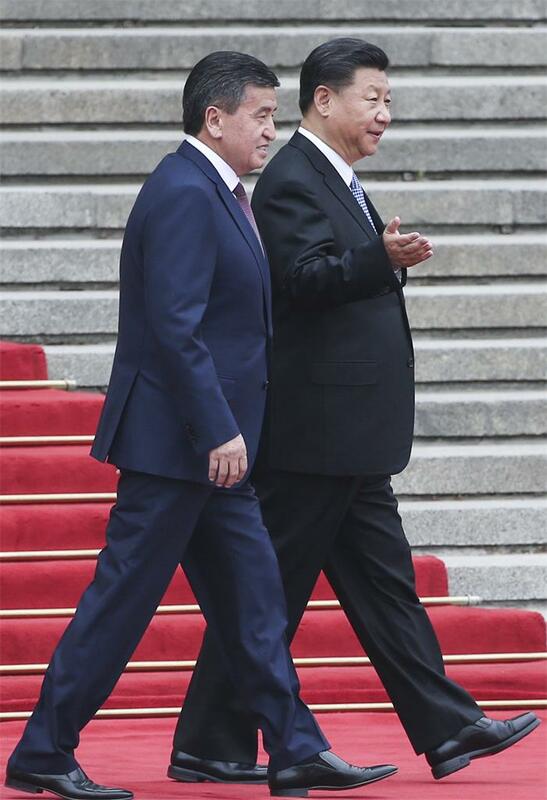 Jeenbekov is on a state visit to China. Afterward, he will attend the Shanghai Cooperation Organization Summit in Qingdao, Shandong province, on Saturday and Sunday. The two presidents signed a joint declaration to upgrade the bilateral relationship to comprehensive strategic partnership. Witnessed by the two leaders, China and Kyrgyzstan signed a number of cooperation documents covering such areas as energy, economy, technology, trade, health and media. With efforts made by both sides, China-Kyrgyzstan ties have developed at a fast pace and have reached their highest level, Xi said. Xi pointed out that high-level exchanges between the two countries have been enhanced continuously and mutual political trust has been strengthened. Their cooperation on the Belt and Road Initiative has resulted in early outcomes, which will bring real benefits to the people of both countries, Xi said, adding that he is confident about the future of China-Kyrgyzstan relations.